On October 20th, weâ€™re hosting our statewide bioblitz: Counting on the Corridor! Weâ€™re connecting Floridians with the beauty and biodiversity of three conserved locations within the Florida Wildlife Corridor to highlight its incredible biodiversity, and ultimately the need for further protection. While we explore, weâ€™ll be collecting useful data at three diverse habitats that are all critically necessary to our State. At our upcoming bioblitz event, you can learn more about how Conservation Florida is saving land within the Florida Wildlife Corridor. You'll also have the chance to interact with Floridaâ€™s native species while learning from expert naturalists, and the data you collect could be useful in protecting the plants and animals that make up our unique ecosystems. What in the world is a bioblitz? Our bioblitz welcomes people from all backgrounds to explore the land, engage in science, and connect with some of Floridaâ€™s most special places. Itâ€™s an opportunity for citizen scientists and experts alike to explore nature to find, count, and identify the biodiversity in an area. Participants come together to find, COUNT, and identify as many species of plants, animals, microbes, fungi, and other organisms as they can spot! You can learn more by watching this short video. Florida is home to many unique species and diverse habitats. Counting on the Corridor allows citizen scientists of all skill levels and ages to explore pristine coastlines, crystal-clear springs, and open prairies. During our statewide bioblitz, the community of citizen-scientists will work with subject matter experts to count wildlife in three very different habitats. We will have activities throughout the day that are designed to be fun and informative for families, community groups, and people of all ages and abilities. OK, now whatâ€™s a wildlife corridor? While the term â€œcorridorâ€� isnâ€™t quite a buzzword, it may be one of the most important topics we can bring to the table in the conversation about conservation. Sometimes called a conservation corridor or greenway, a wildlife corridor is a piece of land or a habitat that links together two larger wildlife habitats. These connectors, if you will, allow wildlife to migrate and disperse on a large-scale. Corridors are crucial in Florida because they make sure local animals, like the Florida panther and the black bear, can move about freely. These pieces of land that serve as bridges between large, protected lands keep our biodiversity strong. Now the question is, why do they matter? Corridors are important because they lessen the fragmentation of natural landscapes. Florida is the third most populous state in the country, and itâ€™s growing at a rapid pace. With all these newcomers, the demand for natural lands to develop is also increasing. Isolated land prohibits species from breeding with other populations, thus putting our biodiversity in danger. Even though we already have lots of protected sites in Florida, we still run the risk of losing important species when they are restricted to one location. Corridors offer a way to protect the habitat that plants and animals need most to survive. â€¦and weâ€™ll be exploring the Florida Wildlife Corridor? Yes! You may have heard of our friends, the Florida Wildlife Corridor, a nonprofit formed to promote the connection and protection of critical habitats. The â€œFlorida Wildlife Corridorâ€� is also a vision that many conservation groups share of a statewide network of permanently protected lands and waters. The vision is based on scientific research completed by the University of Florida to identify areas of high biological diversity in Florida. 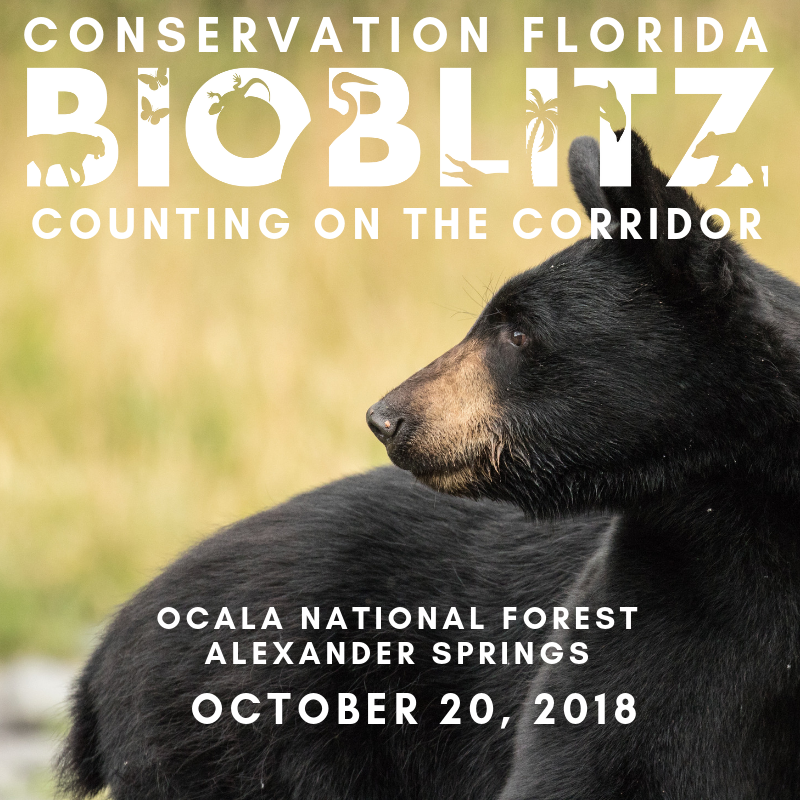 Our bioblitz will emphasize the incredible biodiversity within the Florida Wildlife Corridor, which ultimately supports its continued and expanded protection. Conservation Florida supports the creation of The Florida Wildlife Corridor by protecting land that falls within the Corridor. The land we protect can be agricultural or natural as long as it provides a critical link between other protected lands. Take a look at our land protection map to see where we work. 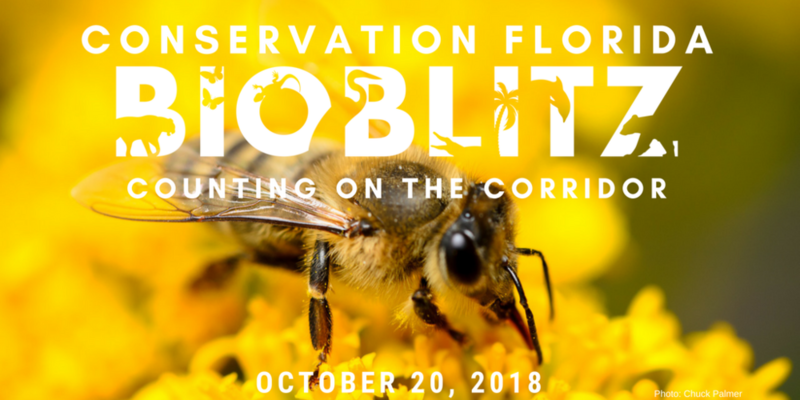 At our upcoming bioblitz event, Counting on the Corridor, you can learn more about how Conservation Florida is saving land within the Florida Wildlife Corridor. You'll also have the chance to interact with Floridaâ€™s native species while learning from expert naturalists, and the data you collect could be useful in protecting the plants and animals that make up our unique ecosystems. 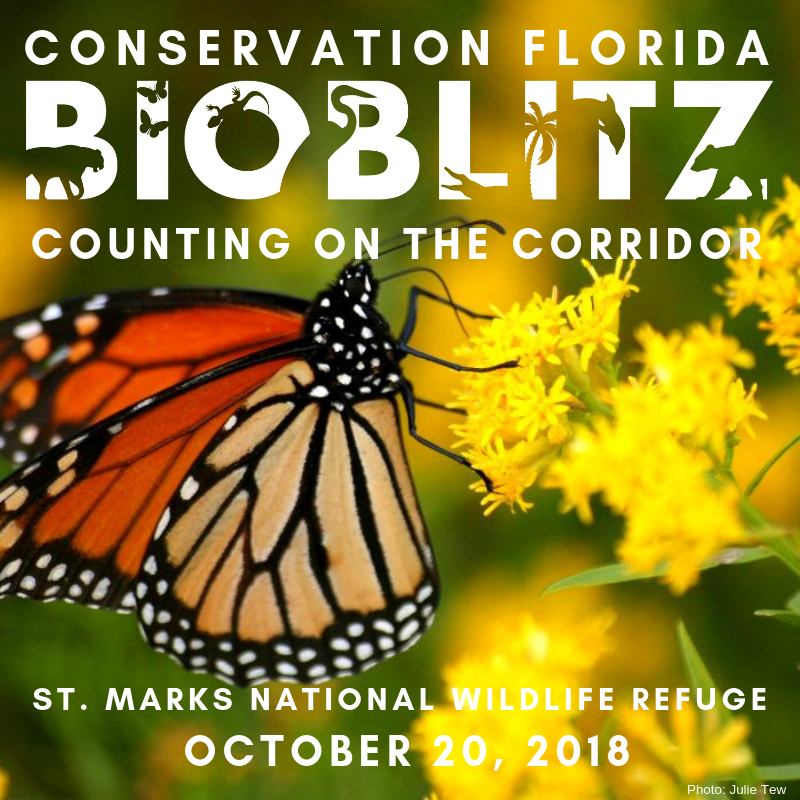 Our bioblitz will be hosted in three different locations across the state that are located within the corridor: St. Marks National Wildlife Refuge, Alexander Springs Recreation Area, and Kissimmee Prairie State Park. We are featuring a coastal habitat that should be encountering annual monarch butterfly migration, a sand pine scrub forest with a first magnitude spring, and a dry prairie. All three locations fall within the Florida Wildlife Corridor and offer a snapshot of Floridaâ€™s vast habitat diversity. How should I prepare to participate? Then, plan as you would for any daylong adventure in the great outdoors. Some of the activities are guided hikes that require a considerable amount of walking on trails that might be difficult to navigate. Some activities occur on and in the water. You may encounter a variety of wildlife, including: snakes, mosquitoes, ticks, spiders, tortoises, birds, and butterflies. You should wear comfortable walking shoes and bring sunscreen, bug spray, protective clothing, and water. You will also want to check the weather and download a map to your location ahead of time in case cell service is not available along your route. How do I record what I see? If you haven't already done so, please download the iNaturalist app to your smartphone. This app allows you to record your observations directly to Conserve Florida's bioblitz project. Please visit the iNaturalist tutorials for more information and join our iNaturalist project here. Select the location where you plan to participate and record your findings on the day of the event! You can also share your experience on social media using #flbioblitz. Everyone! We will have activities throughout the day that are designed to be fun and informative for families, community groups, and people of all ages and abilities. A smartphone is required to participate in the species cataloging activities but not needed to enjoy learning about and experiencing natural Florida. The event is free, but park entry fees may apply. If you would like to make a donation to Conservation Florida to help support our exciting work to protect natural lands in Florida, you may donate here. We're here for you. Reach out to us at info@conserveflorida.org. Join us at Counting On The Corridor on October 20th to observe, enjoy, and count all of the biodiversity that Florida has to offer!